"Whoa! You've used Cranky's Cane Jump 10,000 times! Hop to it, gramps!" If you like to follow fellow Nintendo gamers on Miiverse your options for tracking their gaming habits are nevertheless relatively limited; you're reliant on others actively bothering to post in game communities, in most cases. Exceptions to this rule include Hyrule Warriors - and a select few other games - that include optional automatic achievement notifications on Miiverse. The Wii U lacks Trophies or Achievements at a system level, but titles like this offer the chance to automatically share snazzy in-game achievements with a nice medal or screenshot; it's a pleasant and low-effort way to show off, at least. According to the code-scrabblers at The Cutting Room Floor, a mechanic like this was planned for Retro Studios' brilliant platformer Donkey Kong Country: Tropical Freeze. A 'Miiverse' strings file has a whole load of strings that are clearly achievements, but for whatever reason this wasn't included in the final product. It's a massive list, but a few of our favourites are below - presumably these would have auto-posted with a screen or medal to Miiverse, as per other titles. You hit every boss to the max! Flying fists of fury! You beat the level without taking damage! This Kong is untouchable! You've completed all the levels on this island! Kong supremacy! You've filled the diorama gallery! You could stare at it for days! You bopped 3 creatures in a row! Look, Ma, no ground! Whoa! You've used Cranky's Cane Jump 10,000 times! Hop to it, gramps! It seems a pity that these achievements never made it in - frankly, we'd happily have them in a patch, even as the game approaches one year old. Would you have liked Miiverse achievements in Donkey Kong Country: Tropical Freeze, or would you prefer that everyone stop showing off? Let us know. Yep, did all those accomplishments (well, except maybe the Cranky's cane 10,000 times). Too bad the miiverse implementation of this wasn't utilized. Thank Arceus that this never happened! Nothing's more annoying than all these self-absorbed achievement/trophy hunters. Achievement hunters are just a different type of gamer now. Some people are completionists, some are explorers, some are griefers, and some are Achievement hunters. I wish Nintendo would get with the modern gaming era and create a strong enough profile system to finally include a system-wide Achievement system, you know, like literally everyone else. Microsoft, Sony, and Valve all have them. I like Achievements/Trophies for the STATS! I like having that record of things I've accomplished and done, and they're fun to unlock. I tend not to go out of my way for them, and some games do them poorly (Onechanbara for X360 springs to mind), but they're a good thing to have and everyone loves unlocking stuff. Nintendo not having this just highlights one more way in which they simply do not understand the modern gaming industry. It's just one more type of gamer they don't appeal to. It's a pity these weren't included in the DK game, but a bigger pity that Nintendo simply fails to create their own system of Achievements. Tropical Freeze has still been my favorite experience on the Wii U so far. @Kaze_Memaryu I think some title's ingame achievements are pretty neat. You know, when you actually get stuff from completing random challenges/tasks ala "killed enemy A X times" or "explore all of Area B", stuff you just get as you're playing for a while. Games like Borderlands or Xenoblade come to mind where you're getting extra points (in BL) or items (XBC) as you are playing through them. Having been an achievement whore on the Xbox 360 since 2007 until recently, I've got this whole achievement thing out of my system for now. I do like the concept of collecting the stamps off of Wii U games though to be unlocked for use in the Miiverse though but I don't take them seriously. Some people do want an achievements system on the Wii U implemented, and it would be a nice addition whether you care about them or not. There is clearly interest in them and it would possibly draw more people to the Wii U. However, I feel chasing achievements can take the enjoyment out of a game, that's what eventually made me decide that I need to put my 360 to rest and come back to my Nintendo consoles. I haven't played Tropical Freeze yet but I will pick it up eventually. I've only had a Wii U for 3 months so far and I'm overwhelmed because I haven't played any Wii games which were 2007 or later except Mario Party 8 & 9 so I'm playing catch up. I'm also replaying the SNES DK Country and will move onto the Wii DK Country Returns which came out a few weeks back on Wii U eshop. Some of you are going to flame me, but I find achievement system to be very effective in keeping me playing the game. I really hope nintendo implement this system on both the wii u and 3ds soon. @Quorthon That's absolute nonsense. Achievements are just an arbitrary system to shoehorn challenges into games which lack them, or reward you for playing the game. It's like that pat on the back you shouldn't really require to know you're good at the game, a motivation factor for people who can't have fun with games unless someone tells them they're doing fine (those are also known as "ego gamers"). If anything, Nintendo is doing exactly the right thing by avoiding this system. On X360 and PS3, I've had way too many jerks who rage quit because I didn't want to help them with achievements, instead playing the damn game (ask Tim Schäfer about this, he knows what's up!). If developers think achievements are important, they can sitll add them into the game. But seeing how barely any of them bother with it, it's pretty evident that they're only doing it if they have to. @Tsurii897 If they're ingame, they're part of the game, and that's fine. But this console-wide achievement system is nothing more than a virtual d**k-measuring contest where everyone made their own measuring tape just to claim they're better than others. No please, make a whole achievement system or nothing, it's annoying to see your activity log full of these stupid medals from Hyrule Warriors. Ah Nintendo, just in case you were wondering, don't do nothing about this achievement thing and millions of gamers from Sony and MS won't be never interested in your systems. Nintendo already has a unique system set up that I enjoy, it is just segregated by game. I'd be very pleased if I had one universal stamp book from all my games I've unlocked that I could combine in posts and that other gamers could view. Stamps fit the overall image of Nintendo, they are unique rewards, they are already in place for a bunch of games and they even give a more tangible reward that feeds back into community and let's people with no real artistic ability get in on creating something fun to share. I don't know how hard this would be to implement, but I'd love it! Only time I prefer achievements are when they actually unlock stuff. Smash being the perfect example. They should have included them! I love the Miiverse achievements in Hyrule Warriors. Some of these are a great example of what I dislike about most achievement systems. Many lists of achievements are incredibly lengthy to go to, but are more are less random statistics, or things you would have done anyway just by playing the game normally (play multiplayer mode once; defeat 10 enemies; etc.) 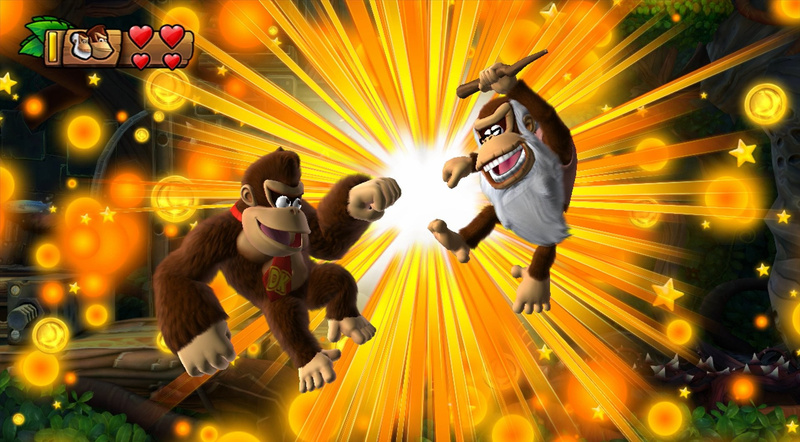 In the case of the Cranky Kong challenge, getting 10,000 jumps sounds like an incredibly tedious thing to try and do, and I can't imagine feeling any amount of success or enjoyment from completing something like that. The best achievement systems are concise and are filled only with extra things you wouldn't have thought to do normally (beat this world without taking damage, without using a healer, collect all [blank], etc), thus prompting you to do something extra. I don't know about anyone else, but I feel a weird cognitive dissonance whenever I am rewarded for something I feel isn't cause for celebration. @Flopsy86 I agree, have to admit that a certain achievement that included completing Raining Blood on expert (Guitar Hero 3) led to me not experiencing the best game ever released on a non-Nintendo console to the fullest. Of course the game I'm talking about is 1 vs 100. When 1 vs 100 season 3 was cancelled, I was extremely sad and that was one of the big things that eventually pushed me away from Xbox outside of Rock Band and Rocksmith. While this would be cool what I really want is DKC:TF Amiibo support. It's not that I really care about achievements, so it's no loss for me. @SuperCharlie78 I find it VERY hard to bieve that any sane persin would abstain from a system because they dont receive an arbitrary rewards system that holds no weight or value. I don't care at all for 'random' achievements. When I got to 200%, I just posted a screenshot on Miiverse and that was enough bragging for me. Expanded categories include Friend, Griefer, Opportunist, Planner, Politician, etc. It seems that you've had some kind of bizarre difficult time online with people Achievement hunting, but they aren't bad people, they're just a different type of gamer than you. It's absolutely nothing to be angry about. Gamers like Achievements--not all, and that's fine. But to deny that this is a part of modern gaming, and Nintendo is "right" to fail to appeal to this large group is denying reality. Frankly, I like getting Achievments and Trophies. It's fun, and it sometimes inspires me to try things a different way in a game. Some are pointless, like collecting orbs in Prototype--particularly the "hint" orbs, since I knew all the hints they told me before I picked them up. If you don't like them, then what does it bother you if they're in a game or not? Nintendo has enough issues looking behind the times as it is, and this is just one of those things that hurts them. I find it odd that you would be so against the very concept rather than championing Nintendo to not only incorporate an Achievement system, but to do it in a truly meaningful way that MS, Sony, Valve, Kongregate, etc have not envisioned. To that end, Nintendo has numerous games with built-in achievement systems in some capacity, and in my team's game, we incorporated them as a way to work for unlockables. Microsoft has advanced Achievements on the XBO so that, apparently, many of them come with art that can be used as backgrounds for the menus. I have to admit, that's pretty cool. Also, I have never, ever seen anyone trying to brag about their Achievement score over anyone else, and this is after a generation of heavy Xbox 360 gaming. Remember, the very first video games recorded high scores, and this is no different. This is just the next evolution of the high score or the old Nintendo Power feature that celebrated these things (of which, my name appeared in two issues). Smash Bros comes loaded with achievements in the form of Challenges, and players love to champion their win-loss ratio or work on those things. Your point basically comes off as hating people for winning games or having high scores, and that celebrating this is stupid. Do you feel the same way for Hank Aaron's home run record? (You can feel that way about Barry Bonds since he was a cheater.) Do you think a football player with a lot of successful touchdowns shouldn't be able to celebrate his achievement? There will always be the jerks who flaunt their success in every facet of life. That doesn't mean we should lower ourselves to their level in trashing anyone else's accomplishments, no matter where they occur--be it in gaming, the battlefield, the race track, the office environment, their Oscar nomination, the baseball field, the football field, the boxing ring, or even in World of Warcraft. I'm of the mindset that Achievements should, for the most part, merely be a progress recorder--80-90% of the time, with the remainder for bonus challenges, fun stuff, and the like. What you're talking about removes the Achievements from all gamers and places them squarely into the hands of the super-experts who do nothing but work for these things. There needs to be a common ground that appeals to regular and casual gamers as well as the experts. Take Shovel Knight, for instance. It has some of the most insane achievements I've ever seen--stuff so mind-numbingly difficult to work for, I simply passed them noting that they weren't worth my time. That's too much work and I have too many other games to play. Personally, I think Achievements should be expanded and have a use outside of just adding to a score--even though earning a high score is one of the very cores of playing video games. For instance, Achievements should be used to unlock things within the game, or be related to other rewards--XP, bonus items, unlockables, bonus content, textures, and things like that. Note, I'm not saying your opinion is wrong, I'm only noting that it would be alienating to many gamers. Possibly too many. I hated how the achievements kept popping on the screen when i had PS3, breaking the immersion in every single game i owned. It would have been nice to have these. Additionally, I'm hoping that the next generation of Nintendo Console/Handhelds/Hybrids includes them at a system level. Seriously Nintendo, look at what your competitors are doing right. Also, for anyone who doesn't like achievement notifications, these could theoretically be disabled to appease achievement loving and achievement hating parties. The Xbox One, for instance, has this functionality. I personally love achievements. Sometimes they add to the experience. I remember playing Assassin's Creed and there was a big plot twist and the achievement popped and said something to the effect of mind blown. I thought it was a neat little thing and see no reason why Nintendo shouldn't incorporate something like that. Also all this measurement stuff and bragging rights I just don't get where your coming from. I've done a lot of Xbox gaming and I've never heard anyone put someone down for the gamer score. Well, maybe it'll be in Retro's next DKC game. @Quorthon I see the point of having a progress-tracker, but I feel like that could be incorporated in ways other than individual achievements. I just find it annoying when a pop-up yells "congratulations!" when I hadn't done anything significant. It detracts from the feeling you get when you actually achieve something impressive. And I also find it annoying when the achievements are too numerous and aren't organized well, like the Mii Streetpass Plaza. I think more games need to utilize stamps since I loved using them in Mario Kart 8 and Super Mario 3D World. It's a shame that even main Nintendo games oftentimes don't use them when there is so much potential. I get kinda tired of this whole "Nintendo needs to cater to the modern gamer" mentality. Like the "modern" gamer is a good thing. I get why people would want that to an extent, like voice chat being more commonplace, but for the most part the whole idea of what's "modern" is getting quite annoying. In fact, if you take the idea that you need to wear a mask to be anything other than white in Animal Crossing, the condecending female lead in Metroid: Other M, the lack of sexual diversity in Tomodachi Life, then Nintendo is doing just right by "modern" (and especially American) standards. I think one of the reasons Nintendo fans hate it so is that they just "pop up" out of nowhere in most games instead of providing anything truly meaningful. It isn't exactly "optional" if you can't turn it off. ...Still better a reward system than freakin' CONCEPT ART. @Kaze_Memaryu Does it really effect you? I like getting trophies on PSN. If you don't, then turn off notifications and enjoy your game. I would beg Nintendo to add this! As soon as they removed the Yeah! count in Miiverse profiles I stopped caring about posting unless if I'm bored or helping someone out. No one can see your post anyways since they get buried in 5 minutes. @GhotiH @Quorthon As I said, I had a good number of people who didn't play the game as intended, but only to unlock achievements/trophies. To elaborate on the Schäfer part: Tim Schäfer occasionally played Brütal Legend online against his fans (partially because of a trophy you'd get if you play against a Double Fine member), and he got the message "surrender pls" just 5 secs into the game. The same happened to me, several times, at that. In BlazBlue, it was the same: people were insulting me because I was playing normally instead of losing on purpose, only for them to rage quit on me right before the end. Also, one (or more, can't recall right now) of the Last Airbender games is still recommended as the "recovery game" for people who don't have any games with 100% trophies/achievements, simply because you can get them all in less than an hour during the tutorial section. Maybe your experiences were different, but that doesn't change much. Forcing something that every developer could be doing themselvesis is the wrong way for gaming business, and it has nothing to do with what makes games fun, it just satisifes the ego of people. If you can't feel accomplished about yourself on your own for playing through a game, then I'm sorry, but you have issues. And no, turning off notifications for such things definitely isn't enough. Sony and Microsoft should've implemented the option to not even have trophies/achievements at all, resulting in no more "Gamerscores" to be shown (come on, the very term screams of poser bull), not being part of the pointless trophy percentage system, and not having anything about it shown anywhere in the menu or profile at all. Either way, trophies/achievements have nothing to do with gaming: if you want a challenge, make one by yourself (Nuzlocke Run, low% run, no armor run, weak attack only, playing characters you're bad with) - if a game wants you to be challenged, that will be fully possible without a motivational setup that is either useless to the game, or proof of lacking game design. And if you lack the creativity to come up with such things, the internet has a lot of ideas on that end. Crown on the profile screen and a Mii costume based on the game to be rewarded as the platinum reward for collecting all stamps/ completing all achievements. For example, completing the Legend of Zelda, the Wind Waker HD earns you a Toon Link Mii Costume, New Super Mario Bros. earns you a Mario Costume, Super Mario 3D World, a cat suit. Luigi's Mansion 2 (Dark Moon) earns a Luigi costume with the Pultergust 5000. I think the crowns and number of stamps should be displayed on your profile in your friends list. And you should be able to check out your friends stamps in a 'Stamp Book (album)' that is accessible from both Miiverse and the friends list profile. I think that would be a very fun way to ad achievement to WiiU and 3DS rather than a generic pop up that you can never use. @Quorthon : Some people didn't buy Wii U, because lack of achievements. People should decide to use this or not, and not Nintendo. Someone at Nintendo said once that it could ruin how you play games, and its true for some people, but not everyone. The best thing is to play game normally first, then grind afterwards if you want. Achievements should have been there, and even Android have it. Android had it for years.. First with OpenFeint, then SWARM and now "Google Play Now". Nintendo needs trophies or achievements...they could be called Coins for them. This is one thing that gets a lot of people to replay the games and have fun while doing so, adding more of a party-element to every game. I'd love to see this on a nintendo console, but something like this may not happen. It saddens me that they were even forced to waste development time on this garbage. I don't need a game to tell me that I defeated a boss or that I jumped 20,000 times. I love the Xbox achievements. When I first played Super Mario 3D World, I thought that Nintendo came up with a better achievement system until I found out that you could only use the stamps collected in-game, in post created through 3D World into Miiverse. Nintendo should allow you to use any stamps collected in every Miiverse post. This way, if I created a Miiverse post in NES Remix with a Mario Kart 8 Time Trial stamp, people would see that I earned the stamp; and think about all the cool post you could create by mixing all the stamps that you collect. @Kaze_Memaryu very true. Couldn't agree more. A lot of the achievements you get by just playing through the game. I must admit achievements would be a great addition to NIntendo games. Stamps are all that I want. Unlock them just like achievements and then use them on Miiverse! Nintendo had the right idea, with MK8 and 3D World. I just wish I could use any stamps on any Miiverse community! I wish Nintendo had achievements. I like them on Steam, I like them on my PS4, I wish they were on my Wii U. There. Come at me, fanboys. I think just beating a particularly difficult stage or world is an achievement in itself. I prefer stamps to achievements. I think they should still include them, but without miiverse. I want to see them whenever I like, also when I play offline.